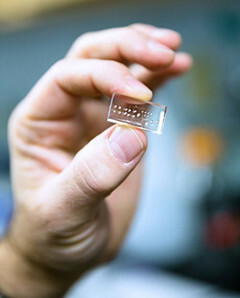 The new device is made entirely of polydimethylsiloxane (PDMS), a soft, flexible material used in microfluidics as well as in products such as contact lenses and medical devices. The all-in-one device allows for biological sample processing and optical detection on one chip. The chips contain both solid-core and hollow-core waveguides for guiding light signals, as well as fluidic microvalves to control the movement of liquid samples. A special microvalve functions as a “lightvalve,” controlling the flow of both light and fluids. Potential applications for this technology include a wide range of biological sensors and analytical devices. For viral diagnostic assays, for example, fluorescently labeled antibodies can be used to tag specific viral strains for optical detection.